The hardy Convict Tang makes a good aquarium addition for the budding marine enthusiast! The Convict Surgeonfish Acanthurus triostegus is one of the smaller tangs available for the aquarium. This surgeonfish seldom gets much larger than about 6 2/3 inches (17.0 cm) in length. It is a widespread Indo-Pacific and Pacific species stretching from the west at Kenya into Indonesia, at the Hawaiian Islands, and east to the lower Gulf of California to the Panamas. It rarely exceeds 7.87 inches (20 cm) with only rare specimens reported at 10.62 inches (27 cm). Although it is not as striking in coloration as many of the tangs you will see, it is certainly distinctive. It has a white body with six vertical narrow black bars, five on the body and one on the head running through the eye. It is aptly named the Convict Tang, but another common name is the Fiveband Surgeonfish. The basic black and white pattern is the same for all specimens across this vast expanse, but there are some geographical variations. There is a black mark at the base of the pectoral fin which can vary from a spot or short dash in most species, but forms a line in the Hawaiian form. This is the mellowest of the Acanthurus species. Like Zebras (the African mammal), Convict Tangs will school in large groups using their striped pattern to throw off predators, making it difficult to zero in on an individual fish. These large aggregations feed on algae, and unlike other tangs, they do not employ their caudal spine for defense very often as it is poorly developed. The Convict Surgeonfish is moderately hardy with proper care. It has proven itself to be one of the easiest tangs to keep, making it a great fish for the beginner with the appropriate tank size. It will quickly adapt to its environment and is quite hardy. A minimum sized tank of 100 gallons is needed to accommodate its size and swimming needs, but providing 125 gallons or more, and a tank that is 6 feet or longer suits them best. These tangs swim at all levels of the tank and will wedge themselves between rocks and crevices at night. Arrange the rock work in a manner that allows an open swimming area at the top of the tank, but with nooks and crannies below in which to hide. They are active and constantly grazing so they need be fed at least three times a day. Like all tangs, they need clean stable water and lots of oxygen to stay healthy. This can be accomplished with good surface agitation, a good quality skimmer, and regular partial water changes. The Convict Tang can be kept in schools in a very large tank, or happily alone in a peaceful community tank. In super large tanks, reaching 10 feet, they can be kept as a small group of their own kind. The Convict Tang should be added first to a very large community tank that will house other tangs. But do not house it with Sohal, Clown or other more aggressive tangs. These Convict Tangs are full grown and temporarily housed here to show their detail. The Convict Tang (Acanthurus triostegus), grows to 8" and needs a 125 gallon tank to be happy and healthy long term. The dark blotches between their stripes are due to these fish being frightened, and they are not typically visible once acclimated. All tangs are huge producers of waste and they do need larger tanks with good filtration to help keep the water quality up. Convict Tangs can be added in groups of 3 into the same tank, as long as it is done at the same time. They are peaceful and other tangs typically will pick on them. Feed "veggies" to help keep them healthy! A large school of Convict Tangs in the wild! This is a beautiful video showing the Convict Tang, Acanthurus triostegus, in their natural habitat in Oahu! It almost looks like marine zebras feeding on the "plains" of the ocean! They will grow to 8" and will need a tank that is 125 gallons (6 feet long), with good filtration and they are one of the tangs that can be kept in a small grouping if introduced at the same time into the tank! The yellow hue on the top of their bodies and freckled face would make anyone want one! Their "scalpel" is quite small compared to other tangs and they are typically picked on by larger and more aggressive tangs in captivity. The Convict Surgeonfish Acanthurus triostegus was described by Linnaeus in 1758. The genus name Acanthurus means "thorn tail." The common names they are known by describe their color patterning and their sharp retractable tail area spines. These include Convict Tang, Fiveband Surgeonfish, and Convict Surgeon. These tangs are widespread. They are found in the Indo-Pacific except for seas around the Arabian Peninsula, in the Pacific at the Hawaiian Islands, and in the Eastern Pacific they are found in the lower Gulf of California and down to Panama, including the Revillagigedo, Clipperton, Cocos, and Galapagos Islands.This species is listed on the IUCN Red List of Threatened Species as Least Concern (LC) due to its wide distribution. It is harvested in some areas as a food fish and for recreation, but is common and abundant throughout its range. This species is a member of the Acanthuridae family of Surgeonfish. It belongs to the subfamily Acanthurinae as a member of the Tribe Acanthurini, in the large Acanthurus genus. Acanthurus is the type genus of the Acanthuridae family and there are currently 38 recognized species in this genus. Containing almost half of the currently 82 Surgeonfish species, this is the largest genus in the family. Acanthurus are found in the tropical, subtropical, and some temperate waters of the Atlantic and Pacific. The majority of the species occur in the Indo-Pacific Oceans but there are 5 species found in the Atlantic Ocean. The Western Atlantic is home to four of these; the Blue Tang Surgeonfish A. coeruleus, Doctorfish A. chirurgus, Ocean Surgeon A. bahianus, and the Gulf Surgeonfish A. randalli; with the Monrovia Doctorfish A. monroviae occuring in the Eastern Atlantic. Surgeonfish usually live in large schools or in pairs. Coastal waters, harbors and even estuaries for the young are prime areas for many of these fish. They feed during the day, but at night they sleep in small caves or crevices in the reef. Typical of their family, many Acanthurus species occur in relatively shallow waters. The clear water and good sunlight promotes lots of algae growth on the rubble, rocks and coral skeletons for the herbivorous species to browse on. Those that are detritivores also occur here, feeding on detritus and diatoms from the substrate, often ingesting sand in the process. Some of the detritivores are also specialized for eating the feces of carnivorous fish. The smallest group of Acanthurus species, the zooplanktivores, swim in the open water feeding on miniscule prey. Many members of the Acanthurus genus are very colorful, making them popular aquarium inhabitants. On average the species range from small species, such as the Brown surgeonfish Acanthurus nigrofuscus at 8 1/4 inches (21 cm), to the large Yellowfin Surgeonfish Acanthurus xanthopterus reaching up to 27 1/2 inches (70 cm). The smaller Acanthurus species can be kept in a good sized home aquarium but the larger fish, though often featured in public aquariums, are not really suitable for most hobbyist's tanks. Acanthurus species are often very territorial towards conspecifics in the wild, fiercely defending their area and foods. In the aquarium the attitudes of individual species vary, but they all tend to be aggressive towards their own kind. Some will bully other types of Surgeonfish as well, especially if added after the resident Acanthurus is established, There are even a few "bad boy" species that get so aggressive in the aquarium that they will dominate the tank, attacking all other fish. These tangs are best kept singly in most aquariums, with some possible exceptions when the tank is very large. The Convict Surgeonfish can be found at depths between 1 to 295 feet (0 to 90 m). Adults occur in lagoon and seaward reefs with hard substrates. They are often seen on reef crests, shallow exposed reef fronts, and over zones of branching hard corals of the genus Madrepora. They also are found near freshwater run-offs where they graze on algae. Juveniles are found in shallow waters under 3 feet deep in tide-pools and reef flats. Convict Tangs are omnivores that use their mouth, which is positioned in a downward direction, and their flexible comb-like teeth to graze on benthic weeds and algae. But they will also will eat phytoplankton, benthic crustaceans, and cnidarians (hard coral). They feed during the daylight hours and wedge themselves between crevices and caves at night to avoid predation. Adults may be seen singly or in small groups, but they often form large schools to penetrate territories defended by pugnacious damselfish to feed on the filamentous algae growth. Other herbivorous fish may school with them. Large, dense aggregations of these fish have been observed extending across areas of more than 50 feet in diameter. They will often join with other surgeonfish, parrotfish, and rabbitfish to penetrate the algae rich territories of other herbivores. They will school to spawn as well, with groups containing tens of thousands of fish. Within these large groups the spawning takes place in a pulsing fashion with just 10-20 fish, and they also still spawn in pairs. They are preyed upon by the Agus Grouper Cephalopholis argus, Ash-Colored Conger Eel Conger cinereus, Honeycomb Grouper Epinephelus merra, Cornet Fish Fistularia petimba, and the Black-Tail Snapper Lutjanus fulvus. The Eagle Ray Myliobatidae sp. will also prey on clouds of eggs and sperm when these tangs are spawning. Convict Tangs may consume toxin-producing algae, so be cautious when eating any large reef fish, especially those from Hawaii and coastal Central America, because they may contain the Ciguatera toxin. This toxin is harmless to fish, but poisonous to humans. Social Grouping: Varies - Can be found alone, in small groups or in large schools. The Convict Surgeonfish has an elongated oval body with a single caudal spine on each side of the caudal peduncle (base of the tail fin) which folds down into a grove. The caudal spine is under developed compared to other tangs, however, so is not used as defense very often. They have a continuous dorsal fin and a slightly protruding mouth. Like other tangs, they have an expected life span of 30 to 45 years (Choat and Axe 1996), though they generally live shorter lives in captivity. Unlike other surgeonfish, the male tangs from this genus are shown to be smaller than the females. The common length of the male Convict is 6.69 inches (17 cm), and they rarely exceed 7.87 inches (20 cm). Females are several inches larger than males and can reach a maximum size of 10.62 inches (27 cm) when full grown. Tangs will grow 80% of their total length in the first 4 to 5 years of life, and then grow slowly after that. By 4 to 5 years of age, female Convicts will reach about 8.5 inches (21.5 cm) while the males will only be about 5.5 inches (14 cm). Adult Convict Tangs have a dusky white body with six vertical narrow black bars, five on the body and one on the head running through the eye. The upper dorsal portion of the body is grayish green to yellow, shading to white on the belly. The fins are white and the eye is yellow. Juveniles are all white with the black stripes being thin and widely spaced, and with no yellow. These tangs are widespread across the Indo-Pacific and Pacific Oceans and there are some geographical variations. There is a black mark at the base of the pectoral fin which can vary from a spot or short dash in most species, but forms a line in the Hawaiian form. Hawaiian species are sometimes regarded as a subspecies by some authors, and called Acanthurus triostegus sandivicensis. This fish has the additional common name of Manini. Lifespan: 30 years - In the wild surgeonfish can typically live 30 to 45 years, possibly less in captivity. The Convict Tangs are moderately hardy, making them good for beginner or intermediate aquarists as long as they have the proper tank size. They need a good sized tank to accommodate their size and swimming needs. A minimum of 100 gallons is suggested, but providing 125 gallons or more, and a tank that is 6 feet or longer is better. Juveniles that are at least 3 to 4" long are much easier to acclimate to captivity than large adults. Being continuous feeders, they need to be provided a proper diet and should be fed 3 times a day. A moderate light will help grow algae for them to graze on, but in lieu of that, having algae sheets available for them to munch on in-between meals is appreciated. They will need vigorous filtration, protein skimming, stable water parameters, and regular small water changes. All Surgeonfish are wild caught and newly imported tangs can suffer from a mix of internal and external parasites, poor handling and housing, and a lack of nutrition. When selecting your fish, for the best success in keeping it long term, there are a few important things to consider. Make sure it has been in captivity for a while, it should be lively and actively picking at the decor. The coloring should be good and in shape, a pinched stomach is not necessarily a problem and can often be resolved with a good feeding regime. But be cautious if the upper body behind the eyes is sunken in when viewed from the front. All Tangs should be isolated, quarantined for a couple of weeks after purchase so they can rest up. This also gives you an opportunity to observe and treat them for possible diseases before introducing them into your main system. Aquarist Experience Level: Beginner - Beginner to intermediate, but do require a large tank. The Convict Surgeonfish are omnivores, In the wild they primarily graze on benthic weeds and algae, but will also eat small invertebrates, phytoplankton, algae, and some hard corals. In the aquarium these tangs will quickly accept substitute foods, especially algae. After acclimation they will usually eat all kinds of foods including flakes. Provide a quality diet of flake, pellet, and frozen/thawed foods containing algae or spirulina. Live rock with algae growth will be greatly appreciated as it will allow this fish to constantly scrape with its rasping teeth, and it will enjoy any little invertebrates like copepods and amphipods. Japanese Nori or other seaweed can also be adhered to the aquarium glass with a vegetable clip. Offering some meaty foods will help add calories for bulk, especially as juveniles. They will feed on frozen brine and mysis shrimp, mosquito larvae, grindal worms, tubifex, and Enchytaeidae. Feed them at least three times a day in smaller amounts instead of a large quantity once a day. This will keep the water quality higher over a longer time. Providing a vitamin supplement (including vitamin C) can help provide for their nutritional needs, and vitamin C may also help reduce Lateral Line Erosion (LLE). Vitamins can be provided in several ways including soaking dried pellets with liquid vitamins, adding vitamins to the food, or adding a liquid vitamin into the water. Some hobbyists suggest that pellets soaked in garlic may help fend off Marine Ich. Hobbyists also report success with supplemental foods such as previously boiled or frozen zucchini, broccoli, spinach, and leaf lettuce. Diet Type: Omnivore - Though considered an omnivore, its diet consists largely of algae and weeds. Flake Food: Yes - High quality flakes containing spirulina or other algae. Tablet / Pellet: Yes - High quality pellets containing spirulina or other algae. Live foods (fishes, shrimps, worms): Some of Diet - Brine shrimp, mysis shrimp, or other protein sources can entice them to feed if not eating. Vegetable Food: Most of Diet - Vegetable foods, including filamentous algae and phytoplankton. Meaty Food: Some of Diet - Meaty foods help add calories for bulk, especially as juveniles, and can include mysis, fortified brine shrimp, naturally occurring benthic crustaceans, and minced raw table shrimp. Feeding Frequency: Several feedings per day - Best to feed small amounts at least three times a day. A large tank is important for the Convict Tang and it needs clean, stable water conditions. Because this fish needs a lot of food, there is a large bio-load on the aquarium and a smaller tank will foul quickly. Surgeonfish, in general, are not as forgiving as some other fish when it comes to water quality. Regular water changes done bi-weekly or monthly will also help replace the trace elements that the fish and corals use up. A suggested guideline is to keep up with your water testing, which will indicate when your tank needs a water change. Large Tanks 100 gallons and over, once water is aged and stable, can be changed 15% bi-weekly to 30% monthly, depending on bioload. Water Changes: Bi-weekly - Water changes of 15% bi-weekly to 30% monthly in a fish only tank, and 10% every 2 weeks in a reef setting. The Convict Surgeonfish can be kept in a fish only tank or a reef environment, though it may nip at some large polyped stony corals (LPS). Like other surgeonfish, it needs a stable and established tank which is at least 6 months old. Like their fellow tangs, they are fast, agile swimmers, spending a good deal of its time in the open water and moving in and out of crevices looking for that next algae morsel. A minimum sized tank of 100 gallons is suggested, but they usually do better in larger aquariums because they like lots of room to swim. A larger 125 gallon tank that is 6 feet long will be even better. This tang should be the only Acanthurus in the tank unless it is very large and at least 10 feet long for each fish to establish a territory. Do not house it in a nano tank. They will outgrow a small tank too fast and it can cause aggression. They will swim in all levels of the tank. The tank should be well decorated with rocks/corals arranged so there is plenty of surface space for algae to grow along with crevices and caves for them to hide in at night. To provide swimming space, be sure to arrange the rock work to allow an open swimming area at the top of the tank with nooks and crannies in which to hide when frightened. Provide swift linear water movement in at least one area of the tank for them to swim against a current. Any substrate is acceptable. Light should be high enough to provide algae growth, however in a fish only system, supplement them with marine algae if the light is not strong enough. When kept in a reef these factors need to be considered more specifically for the needs of the coral. Tangs produce a lot of waste, so the larger the tank, the easier it is to keep clean. Like all surgeonfish, to stay healthy they need clean stable water that is well oxygenated. Good surface agitation, a strong protein skimmer, and good filtration is recommended for long term health. They do better in lower temperatures from 72° to 79°F (22° to 26°C) that provides higher oxygen saturation. Provide the normal ocean salinity with a specific gravity of 1.023-1.025, and a pH of 8.1 to 8.4. These parameters need to be stable and should not fluctuate. Minimum Tank Size: 100 gal (379 L) - A 125 gallon tank that is 6 foot long is suggested for long term maintenance. Live Rock Requirement: Typical Amount - Hiding places are needed to help reduce stress and for them to hide in at night. Lighting Needs: Any - Lighting is needed to provide algae growth on live rock. If lighting is low, supplement with algae sheets between meals. Water Movement: Strong - Provide an area of the tank with strong linear flow. Water Region: All - They will swim in all areas of the aquarium. The Convict Surgeonfish, like all tangs, is considered semi-aggressive. But this fish along with the Gold-Rimmed Tang (Whitecheek Surgeonfish) Acanthurus nigricans, are two of the most mellow tangs you can buy and can be kept in a peaceful community tank. The Convict is also one of the few tangs that can be kept in a small school in captivity. To keep a school will require a very large aquarium and they should all be added to the tank at the same time as juveniles. If you choose to house the Convict Tang with others tangs from the Acanthurus genus, add this tang first (along with the Gold-Rimmed Tang if you choose it), before other Acanthurus tangs. You can add an Orangespot Surgeonfish Acanthurus olivaceus after them, and then any others afterwards. This mix should be done in a tank that is 10 feet long and hundreds of gallons. It can be kept with tangs from other genus that have similar dispositions in a tank that is several hundreds of gallons, but not necessarily 10 feet long. Choose tangs that each have different eating habits. One can be a detritus eater, another a macro algae eater, and then one that is an omnivore. For example a Blue Tang Paracanthurus hepatus, Naso Tang Naso lituratus, and Convict Tang will get along great if the Convict is introduced first. Mixing up rock work will help if adding a new tang to the tank, as it does break up territories. Do not house them with Sohal, Clown or other more aggressive tangs. In some combinations, while they are all still young, they may get along. However in adulthood problems may manifest and appropriate action will be needed by the aquarist to separate battling tangs. Convict Tangs will ignore other fish, even small peaceful fish, which makes them a great community tank member. The exception to this are assessors, since they are very skittish and will not come out to feed in the presence of such a large fish. Large adult Convict Tangs can handle themselves just fine with larger semi-aggressive fish like calmer triggers, large wrasses, groupers and puffers. These fish great in a large reef setting to help control algae. They eat filamentous algae and will grazing on the algae forming at the bases of coral. Be cautious with Large Polyp Stony Corals (LPS). They may be eaten as cnidarians have been found in the bellies of Convict Tangs in the wild, but you can try to add an LPS coral frag and see how the tang reacts. Invertebrates are safe. There is only a rare report of a tang nipping at the mucus of a clam, causing the clam to stay closed and die. Temperament: Semi-aggressive - Peaceful towards non-tangs. Same species - conspecifics: Yes - They can be kept in a small school in a large 10 foot tank, and also with other Acanthurus species that look different in this sized tank. Large Semi-Aggressive (tangs, large angels, large wrasses): Monitor - Avoid Sohal and Clown tangs, which are too aggressive. Keep an eye on certain more aggressive large angelfish. Large Aggressive, Predatory (lionfish, groupers, soapfish): Monitor - Avoid groupers that are large enough to eat them when they are juveniles. Avoid lionfish and aggressive triggerfish. Slow Swimmers & Eaters (seahorses, pipefish, mandarins): Monitor - Won't bother Mandarins or Scooter Blennies, however seahorses and pipefish need their own system. Clams, Scallops, Oysters: Monitor - If not well fed, a rare tang will take a liking to the slime clams produce. Unlike other surgeonfish, male tangs from the Acanthurus genus may be much smaller than the females. Breeding the Convict Surgeonfish will probably will not be accomplished any time soon. Surgeonfish are a challenge to breed and rear in captivity. Successful breeding could only be accomplished in a very large display aquarium, and the larvae have proven very difficult to rear. Most home aquarists will not have a tank large enough to encourage spawning with surgeonfish. For the last couple of decades there have been efforts in French Polynesia to collect the larvae of some species as it settles, and then rear the young. Also breeding a few species such as the Yellow Tang Zebrasoma flavescens, Regal Tang Paracanthurus hepatus, and the Naso Tang Naso lituratus has been attempted. But neither of these methods have had sufficient success for commercial production. The difficulty starts after the eggs hatch. In the pelagic larval stage they are very small and easily damaged, followed by a very long planktonic larval stage, and then the fry are very slow growing. In nature, the Convict Tangs that are near the equator will spawn all year round. However the spawning time is shortened for those further away, such as those in the Hawaiian Islands which only spawn during the full moons of February and March. Like other Acanthurus, they spawn in large groups. Within these large groups the spawning takes place in a pulsing fashion with just 10-20 fish. They also spawn in pairs, and these pairs stay together even within groups. The male may exhibit color changes during spawning to attract female and to warn rival males. If they are in a large school, a pair will break away and rise upward toward the surface and release their gametes. The floating fertilized eggs are spherical and have a single oil globule to aid in their buoyancy and dispersal. Each egg measures around 0.17 mm in diameter. Once they hatch, the larvae look like little kites with a long snout with a small mouth, and they stay in this state for 2.5 months. In the late stages of development the larvae enters tide-pools, reef terraces and banks within the tidal zone where the waters that are less than 3 feet deep. Within 4 days on entering into these waters, the larvae quickly changes to the juvenile stage. They are about 1.18" (3 cm) long at this stage. Between 1.18" and 3.9" (3 - 10 cm) they stay inside rocky, shallow waters but the depths they are found in seem to depend on their size. At 6 months of age they are found with adult fish in the outer reefs. See the description in the Breeding Marine Fish: Tangs for more about how they reproduce in the wild. Ease of Breeding: Unknown - Surgeonfish are difficult to rear, yet some progress is being made in captivity. The Acanthurus species are generally hardy once acclimated. However they do need a proper environment and tankmates, and the water quality needs to be pristine and stable, or they can suffer any disease that captive saltwater environments have to offer. They will succumb to illness quickly in a less than optimal environment. Common ailments include bacterial diseases, Head and Lateral Line Erosion HLLE (called Hole-in-the-Head Disease in other species), and parasitic infections such as protozoas (including Cryptocaryon), worms, etc. Although they can be quite durable, Surgeonfish are prone to skin diseases. They produce less body slime than other saltwater fish and have been termed “dry skinned” fish by some. This makes them susceptible to Marine Ich or White Spot Disease Cryptocaryon irritans and Marine Velvet or Velvet Disease Oodinium ocellatum. Both of these are parasites. Surgeonfish are also susceptible to nutritional disorders which may cause color loss and HLLE (head and lateral line disease) which may be caused by poor water quality, unsuitable habitat conditions, lack of endogenous (internal) vitamins, and activated carbon. Symptoms of Marine Ich are constant scratching, culminating with lots of white dots. Some refer to them as "Ich Magnets" because they are the first fish to exhibit signs of illness. Marine Ich results in the fish suffocating from the parasites blocking their gills, keeping them from providing oxygen. Marine Velvet is a parasitic skin flagellate. Symptoms are a peppery coating giving a yellow to light brown "dust" on body, clamped fins, respiratory distress (breathing hard as seen as frequent or quick gill movements), cloudiness of eyes, glancing off decor or substrate, and possible weight loss. In the wild a cleaner wrasse (Labroides spp.) will help them by taking parasites from their bodies, however these wrasses are extremely difficult to sustain in captivity. Alternative fish such as Neon Gobies (Gobiosoma spp.) or cleaner shrimp can help them by providing this cleaning service in the home aquarium. For treatment in captivity, the best routine is a quarantine tank. Provide a stress free environment with good quality foods, places to hide, and a quiet area for the aquarium. For external parasites you can slowly increasing the temperature of your tank to at least 82° F (28° C). That will prevent the parasite from completing its life cycle which includes the attachment to fish. A further combination of the higher temperatures with medicated food will provide timely relief. Some tangs are sensitive to copper because they have an important microfauna in their digestive system, so prolonged or continuous use of a copper treatment is not advisable. It is also said that pellets soaked in garlic may help fend off Marine Ich. Parasites on marine fish kept with live rock or in any type of reef environment can be extremely difficult to treat. Typical treatments like copper and formalin solutions, as well as quinine based drugs are harmful to other marine creatures. However drugs such as metronidazole provide an effective and safe treatment for several protozoan and anaerobic bacterial diseases. Metronidazole works by ceasing the growth of bacteria and protozoa. Metronidazole is an antibiotic for anaerobic bacteria with anti-protozoal properties. This drug is reef safe, and medications are either added to the water or mixed with the fish food. Providing a vitamin supplement (including vitamin C) can help provide for their nutritional needs, and vitamin C can help reduce Lateral Line Erosion (LLE). Enriching foods can be done by soaking dried pellets with liquid vitamins or adding vitamins to frozen and fresh foods. Although somewhat less effective, adding a liquid vitamin into the water can also work. Some hobbyists also report success with supplemental foods such as previously boiled or frozen zucchini, broccoli, spinach, and leaf lettuce. Some hobbyists also report success with offerings of supplemental foods such as previously boiled or frozen zucchini, broccoli, spinach, and leaf lettuce. For more information on diseases that saltwater tangs are susceptible to, see Aquarium Fish Diseases and Treatments. 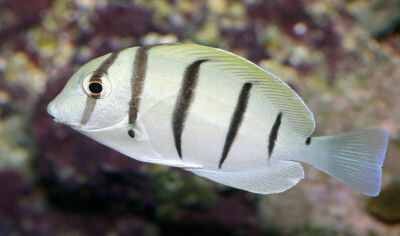 The Convict Tang or Convict Surgeonfish are regularly available online and in stores, and are inexpensive to moderately expensive, depending on size. Wonderful addition to my aquarium. Peaceful and full of character. Very easy to care for... required a bit more time up front until adapted to the aquarium feeding "ritual". I purchased one that the LFS marked down because they had it in a tank full of yellow tangs that were beating it up. It acclimated quickly and swims all over the place in my tank. Not aggressive at all like some other tangs can be. Grazes the rocks and eats pellets, flake, froze and veg/algae sheets no problem. I wanted a Kole Tang before finding this one and I am glad I got this guy instead. Great fish!